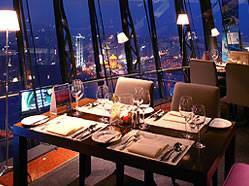 360 Revolving Cafe Restaurant, Macau Tower, Largo da Torre de Macau, Macau, SAR Macau. +853 988 8622 The views over Macau are spectacular and you can see it all unfold before you as the restaurant slowly rotates! Lunch buffet weekdays 11.30am-3pm. Weekends 1st section 11.30am-1pm. 2nd section 1.30pm-3pm. Dinner buffet daily 7pm-10.30pm. Cafe on 4, Level 4, Macau Tower, Largo da Torre de Macau, Macau, SAR Macau. +853 2838 9118 Daily 10am-10pm. Rotunda Revolving Function Room, Metro Park Hotel (was Hotel Grandeur), 199 Rua de Pequim, Macau. +852 2736 0922. The only revolving function room in town, Rotunda is the landmark of Macau. Panoramic views of the harbor, the city of Macau and Taipa Island. 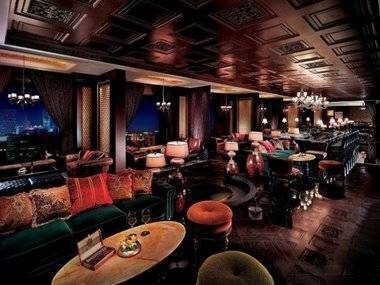 The View Lounge, Sands Casino-Hotel, Avenida da Amizade, Macau. +853 8983 3388. Afternoon Tea Menu from 4pm. Daily Happy Hour from 5pm to 10pm featuring Tapas and Buy One, Get One Free drinks. Rooftop Bar, 3-5-7 Travessa de São Paulo, Macau. +853 2848 2848. Open from 9pm till 2am. Monday closed. Kwun Hoi Heen, The Westin Resort, 1918 Estrada de Hac Sa, Coloane, Macau. +853 8899 1320 Magnificent sea views from inside and on the terrace. Tues to Fri 11am-3pm. 6.30pm-11pm. Sat & Sun 9.30am-3.30pm. 6.30pm-11pm. Starwood. Belon, 31st floor, Galaxy Macau, Cotai, Macau. +1 853 2888 0888 Breathtaking panoramic views over Cotai.